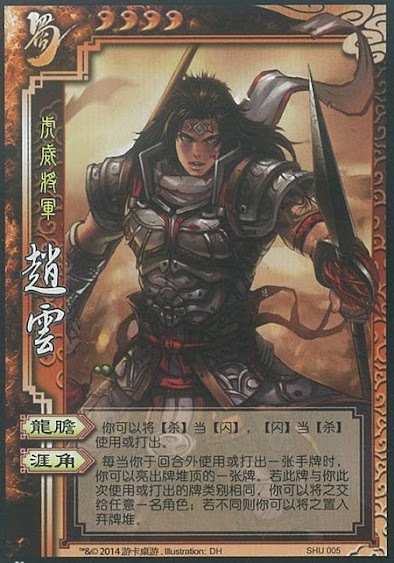 Whenever Zhao Yun uses a hand card outside of his turn, he can show the top card of the deck. If the card he shows is the same type as the one he just used, he can give it to any player. If it is not, Zhao Yun can discard or replace the card. "Dragon Courage" is the same power that the original version of Zhao Yun has. "Corning Maneuver" can only be used when Zhao Yun uses cards outside his turn. If his cards are discarded or stolen, he cannot use his ability. The three card types are Basic, Tool, and Equipment. When Zhao Yun uses "Cornering Maneuver" and is successful, he can give the card to any player, including himself. "Cornering Maneuver" is not a judgment so it cannot be interfered with by any of the tinkerers. When Zhao Yun uses "Cornering Maneuver" and is not successful, he can replace the card to the top of the deck or discard it.